So today, I will present you Chinchilly. This polish belongs to Essie Fall 2009 Collection. Chinchilly is an intresting grey because I find it looks quite differently depending on the lighting. It has a hint of taupe and an even more subtle grey touch to it. Somtimes, I've got the impression it looks like a true warm grey, but sometimes it seems to lean towards green and remembers me of Zoya Gemma. Of course, it's not as green as Gemma but somehow it makes me think of this nail polish...perhaps because the tiny hint of green of Chinchilly belongs to the same green family as Gemma. Anyway, here are the pictures! 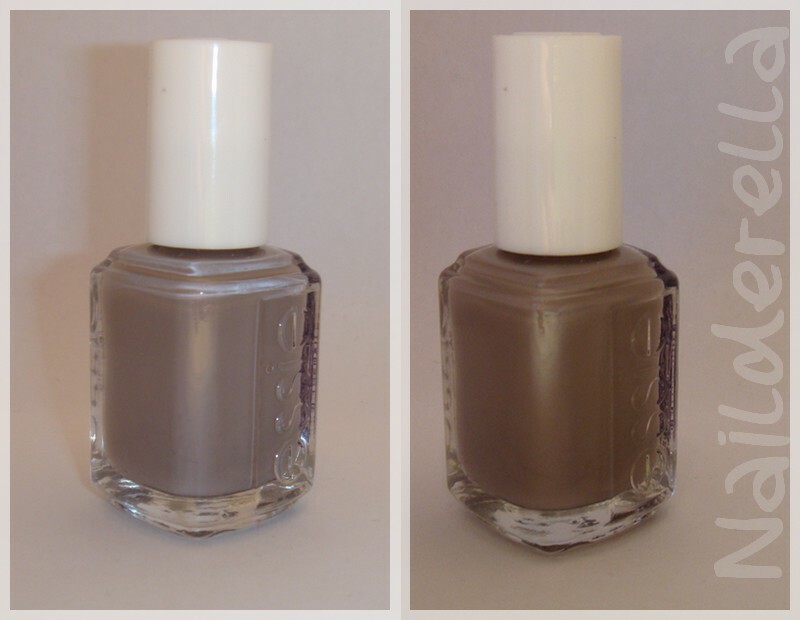 On the pictures below, on the left, you can see the hint of green you have in Chinchilly, on the right, its true warm grey color and the contrary for the 2nd photo. Here is a close-up so you can see the grey vs taupe colors you can see in Chinchilly. Chinchilly is very opaque. You will need only 2 coats to get full opacity. Application was great. Then I added OPI I Juggle...Men as a top coat. And wow! This looks completely awsome! It adds so more depth and style that I love it! This combo is directly, without further ado, entering my top 10 nail polishes!! I Juggle...Men has mainly blue, purple, and pink microglitters or rather nanoglitters. They are indeed really really small and fine but you can see them easily on the nails. It gives a very subtle shimmer to the nail polish on which you apply it. You can see as much purple as blue glitters. And you, what do you think of grey nail polishes? Do you often use special top coat like I Juggle...Men for example? I am really liking the grey polishes this year! I Juggle... Men looks awesome. I might have to pick that one up. Although I am not a big layering fan that one seems interesting. I totally want to pick up this polish, but Essie prices are too steep for me (I'm a cheap-o) it looks so nice with I Juggle.. Men !! Olivia, I understand what you said about glitter top coats! But IJM is a bit different because the glitters are really really fine! They are so tiny! Tera, I'm also liking grey polish! I'm looking forward to the grey nail polishes OPI will bring for the Touring America Collection! Chinchilly is one of my favorites! I even got my mom into wearing it and she was previously a red-only kind of lady! Thanks for sharing the top coat! It's so fun!